We know we descend from Adeline Lucinda "Lucy" Coffman, but her parents were probably not who we've always thought they were. I'd love to receive supporting or dissenting arguments and evidence on this question by email to . I'll update this page with all information provided (while obscuring any identifying information about living people). The following things are claimed on Ancestry without original sources. If you have an original source for this information, for additional information, or for anything contradictory, please email it to the address above. Who Were Adeline Lucinda Coffman's Parents? Everyone on Ancestry.com seems to agree that Adeline's parents were John Coffman and Elizabeth, both born in TN. However, there are several possible John Coffmans from TN who married an Elizabeth in the early 1800s. I propose that most people have selected the wrong John and Elizabeth as her parents. Please understand that this is only a theory at this point. I would love to see information from original sources (not Ancestry trees) that provide evidence for or against my argument. I don't have any original source information, but I do have a lot of supporting DNA evidence. My DNA evidence could theoretically have anonther explanation, but my proposal seems to be well-supported by more than ten DNA tests. John Henry Coffman, born 3 Jul 1804, Jefferson Co TN. Died 15 Feb 1880, Collin Co TX. Mary "Elizabeth" Witt, born 25 May 1809, Hamblen Co TN. Died 18 May 1896, Collin Co TX. If this John and this Elizabeth were our Adeline's parents, she was born two years before her parents were married, and her mother was 14. Furthermore, US Census reports would strongly disagree about her age in 1850, whether she was married and had a child, and the state in which she lived. During the 1850 US Census, they lived in Collin County TX with their eight children. According to the 1850 US Census, their daughter Adaline was 13 years old and living with her family in Collin County TX. According to a different but contemporaneous 1850 US Census, our ancestor Adeline Coffman was about 24 years old, married to Thomas Nichols, and living with her husband and their first child, James Nichols, in McMinn County TN. No one in my family has been found to DNA match to any descendants of the other seven or eight children of this couple. John Coffman, born 9 Mar 1796, McMinn Co TN. Death unknown. Elizabeth Turner, born c. 1795, McMinn Co TN. Died c. 1860, Laclede Co MO. John and Elizabeth were married about 1819, McMinn Co TN. The main problem with this theory is that we don't have any original records confirming that they had a daughter named Adeline or Lucinda or Lucy who was born about 1826. Because our Adeline married Walter Nichols in 1848, her name as a Coffman never appeared on a US Census report. However, the DNA evidence is compelling. multiple lines of descendants of Adeline Lucinda Coffman strongly DNA match to descendants of multiple lines of descendants of this John Coffman and Elizabeth Turner. the ages of this pair of parents is much more in range of what's expected for a child born in or around 1826.
this last item isn't really even evidence, but it's interesting that this John and Elizabeth gave most (but not all) of their children names starting with the letter "A." Most of the people on the "Known" side of this Coffman Tree are DNA matches to most of the people on the "Likely" side of this Coffman Tree. We expect that we'll be able to add quite a few more names and relationships to both sides of the tree in the near future. Click the image below to open the DNA tree, then click the image again to zoom in to a readable level. Use the scrollbar (usually at the bottom of a browser) to move left or right within the tree. This analysis is still under development and may contain errors. I've shown how my immediate Nichols family members match to certain Coffman family members, and indicated other Nichols and possible Nichols/Coffmans who may match to them as well. All of the numbers in the chart below are centiMorgans (cM), a measurement of how much atDNA two people share. AncestryDNA, for example, extimates that anyone with 20cM or more of shared DNA may be fourth cousins. However, these ranges are quite broad. On average, 4th cousins share 31cM of DNA - but the number can range from 0 to about 90cM. About twenty-five percent of fourth cousins don't match at all. 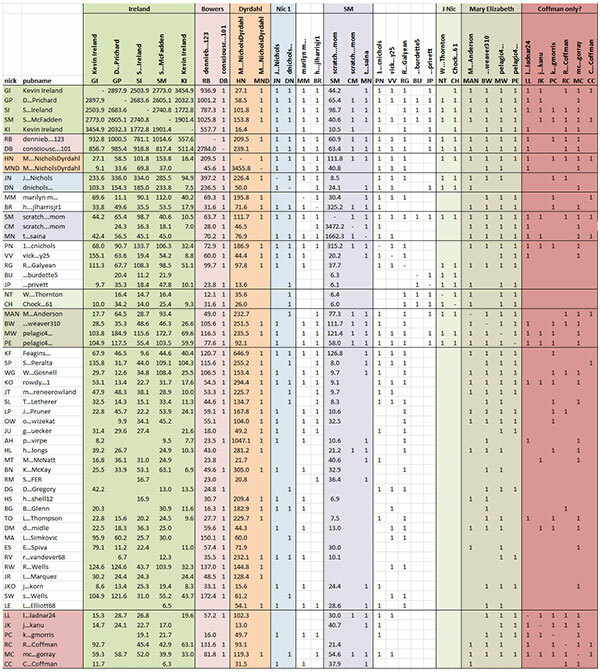 For more DNA ranges for various relationships, view sharedCM Project chart. Click on double-headed arrow at the top right to view the chart in full screen mode. Click on the image below to open it in a browser tab at a more readable size. After it fully opens, you can then click on the new image to zoom in, and scroll up and down as needed. Corrections and arguments for or against this theory are extremely welcome. Please send them to .